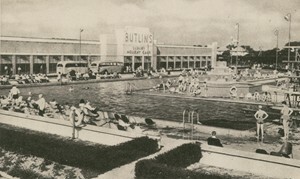 Butlin's first holiday camp, opened in Skegness in 1936, was a phenomenal success, attracting some ten thousand enquiries from the initial half-page advertisement placed in the Daily Express, promising "holidays with three meals a day and free entertainment from 35s to 3 per week according to season". The idea was so popular with the public that by the time the camp first opened its doors on Easter Saturday in 1936, it was already fully booked for the season. Butlin's original idea came from dissatisfaction with the traditional boarding house accommodation that he had stayed in during his former career as a travelling showman. "I felt sorry for myself, but I felt even sorrier for the families with young children as they trudged along wet and bedraggled, or forlornly filled in time in amusement arcades until they could return to the boarding houses". He compared the boarding house holiday to happier holidays he had spent in a camp in Canada, where he formerly lived, and vowed that one day he would build a holiday camp. When he did, it was to be on a grand scale. The Butlin's Camp was a miniature seaside resort, only more so. It sought to create a fantasy world for its residents within its perimeters. That fantasy world was the one they had seen at the cinema and read about in popular magazines such as "Picture Goer", which talked at length about the extravagant lifestyles of the movie stars among numerous glossy pictures. What Butlin attempted to do was to allow his campers the opportunity to escape from their daily lives, not for a couple of hours at the cinemas, but for a whole week. As such, the Butlin's camps, both at Skegness and his second camp at Clacton opened in 1938, reflected this fantasy world. The main camp buildings were essentially modern in appearance. Functional white concrete blocks were used at Skegness, whereas the Clacton Camp was fronted by a magnificent Art Deco facade in the stepped pyramid style. Both camps had outdoor swimming pools with cascades, the pool at Clacton being of an unusual L-shaped design. Inside the camps' main buildings the theme continued. Both camps had bars, large dining rooms and ballrooms, their features designed to create the atmosphere of luxury. 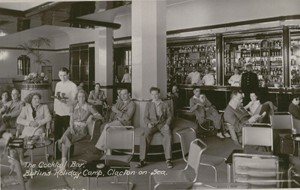 The bar at Clacton was typically 'thirties and could have come from a "Grand Hotel" or luxury liner. It had modern tubular steel furniture, a luxurious tiled interior, copious chrome plate and a uniformed doorman. The ballrooms and dining halls echoed the same style. Paradoxically though, the chalets in which the campers slept, although thoroughly up-to-date for the time with hot and cold running water, were built in "traditional" mock Tudor style, with exposed beams. It seems that on holiday, as well as at home, whilst people were quite happy to go into brash, modern buildings such as cinemas for entertainment, they still preferred to come back at night to their own little Tudor cottage - or at least Mr Butlin perceived that they did. The image of the camps, however, had to be built on a budget, Butlin's needed to ensure that the holidays were reasonably priced. As a result, the luxury atmosphere is to a certain extent skin deep. The two campers filling their mugs with boiling water in the Picture Post illustration sums up the atmosphere. Both are in smart attire, the gentleman in a "Noel Coward" dressing gown - but can you imaging Noel Coward queuing up for water?! The entertainments offered to the campers needed to reflect the opulent image that Mr Butlin wanted to create, and his mass audiences were sufficient to attract the stars of radio, the cinema and the sporting world. Gracie Fields, Elsie and Doris Waters, Will Fry, Will Fyffe (from the popular radio show "Monday Night at Eight"), cricketer Len Hutton, Len Harvey (British light heavy weight boxing champion) who sparred with a kangaroo, and from the world of snooker Joe Davis, all entertained at Butlin's in the 'thirties. Dan Maskell gave tennis lessons and Victor Sylvester gave dancing lessons. Butlin's camps also had their own resident orchestras playing the dance hits of the era. In addition to the major stars from the early days, the Butlin's Red Coats were always on hand to ensure that the campers got the most from their holidays. The idea for the Red Coats came to Butlin early on in the Skegness Camp's first season. He saw the first campers walking around looking bored and not making full use of the facilities. They had come to the camp looking for companionship and were not finding it. One of his assistants, Norman Bradford, started to "jolly up" proceedings by telling a few jokes to the campers assembled in the dining room. Butlin thought this was a good idea and the next day asked his colleague to go out and buy a distinctively coloured blazer - he did, in blue, primrose yellow and white, the camp colours. Butlin was not convinced and asked him instead to buy a red blazer. The Red Coats were then born. The famous "Hi-De-Hi, Ho-De-Ho" routine also started in the 'thirties - Butlin borrowed the idea from an army routine in an American film - continuing the cinema link. The atmosphere of the camps is captured in miniature by some of the badges issued to the campers,originally given out for identification to gain entrance to the camp. The badge issued for Clacton in 1938 featured a bathing capped girl swimmer holding a champagne glass with the caption "champagne air". One lady camper told Picture Post that she saved up all year to have a champagne cocktail on every night of her holiday. Butlin's issued badges - a different design each year - right up to 1967. In advertising the camps, Butlin teamed up with the LNER, who had an interest in promoting holidays on the East coast. LNER actually paid for 50% of all Butlin's advertising costs and Butlin's second camp at Clacton was opened on a LNER line. The Clacton Camp is illustrated by a delightful railway poster produced by LNER showing the swimming pool in the foreground and the main camp building bearing Butlin's famous motto: "Our true intent is all for your delight". Although this is a quote from Shakespeare, Butlin confessed he borrowed it from a fairground organ in his "The Billy Butlin Story"! This type of poster would have been seen in LNER trains and stations in the late 'thirties. Since train travel had only the motor bus to compete with for the majority of holidaymakers, this was a sure way of attracting customers to LNER. The popularity of the camps increased further when the Government passed legislation giving all industrial workers a week's paid holiday in 1938. Butlin's advertisements proclaimed: "Holidays with pay: Holidays with play: A week's holiday for a week's wage". By the end of the 'thirties, fifteen million people had paid holidays. However, in spite of this campaign, the majority of Butlin's campers were not drawn from the working classes, but were from the lower-middle classes, often bank clerks and their wives. The cost of even catering on a mass scale was still too high for most working men, who still tended to go to the traditional boarding houses in the 'thirties. "The rain might creep in; but the landlady did not. Walls might let in draughts; but there were no neighbours close enough to tap on the wall if you snored. You were 'on your own'". "The new form of holiday camp gives you this essential privacy in the shape of a hut or chalet made of concrete, timber and asbestos sheet roofing. ... But added to this privacy, and not conflicting with it, the new sort of camping provides as much social life and as much play and pleasure as you can desire and can endure". In this last phrase, there is possibly a hint of cynicism, but "endure" is more likely to be a mannerism rather than a criticism, as on the whole, Mr Wintringham is complementary about camp life. The new camps were a classic 'thirties compromise; privacy and a full social life; modernity in the style of the buildings and the amenities, but homeliness in the mock Tudor style of the chalets. The criticism levelled at the camps by commentators of the time and in later years was that of regimentation; that the camps made mass produced leisure and compulsory fun and games. Working men, it was assumed, were used to regimentation in their day to day life working at factories, clocking in and out, etc, following the rules. Commentators felt that Butlin's style of holiday provided the regimentation that they had become used to at work in their leisure as well. Tom Wintringham, however, still believed that the camps paradoxically gave campers more freedom, particularly those with limited resources. "The ability to choose what you like without worrying over the cost of it... The bathing in sea or heated swimming pool, the tennis, the games to join in on the greens and the games to watch in the stadium, are all included in the 3 guineas each adult pays. The boating lake, darts, putting and bowling greens, and roller skating rink are all " thrown in" . If others are waiting to play tennis, you can only have half an hour. But if no-one else is wanting your tennis court, you can play from 10am to nearly midnight. Courts are floodlit: games can go on 'till "hostilities cease" at 11.45pm". This is all very true, but the fact still remained that to anyone going on holiday, in search of peace and quiet, the holiday camp would be the last place on Earth on which to find it, and to those who revelled in the company of others, the holiday camp was the ideal place to go. The War came as a shock to Billy Butlin in 1939, he had confidently predicted that the crisis would blow over and was already planning his next camp at Filey due to open in 1940. However, in true entrepreneurial style, he coped with the War when it came. Through a deal with the War Ministry, who took over his camps at Clacton and Skegness, he completed the Camp at Filey and built two other camps at Ayr and Pwllheli. He negotiated a scheme giving him the right to buy the camps back at the end of the War and at the close of hostilities, Butlin was left in a very strong position. His camps really came into their own in the 'fifties and became the epitome of the working man's holiday in that era. The pioneer camps fared less well and many never re-opened. For some, the true spirit of camp life was lost forever.